A 1938 dated SCW M91/30? 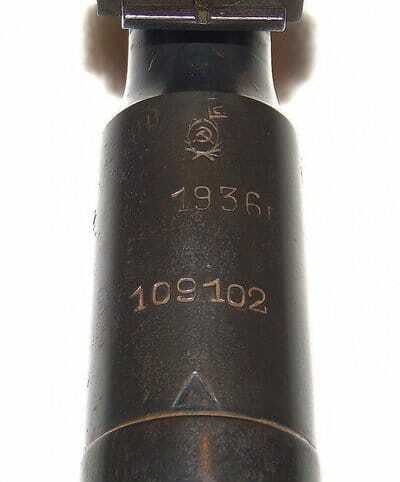 Over the last few years there have been a number of M91/30 rifles reported with a small cartouche in the form of a small cogwheel with the letters "NCL" above it. 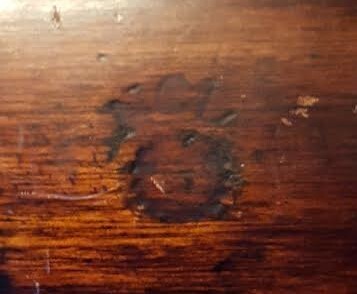 Until recently no one had a very in depth look into this mark, as it is not widely known. At the present date there are only 7 examples of such rifles reported. On all 8 known examples the placement and look of the cartouche are extremely similar. 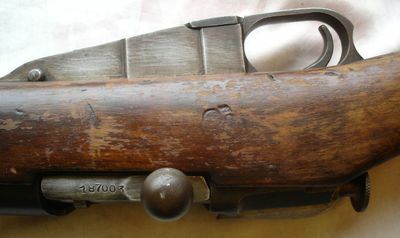 The mark appears stamped in generally the same location, on the right or left hand side of the rifle's stock somewhere between the trigger area and the rear portion of the receiver. On three examples the mark is found on the right hand side, upside down. Most of the examples have the "NCL" portion very well struck, while one rifle has only the cog wheel with no clear remains of the "NCL" remaining. The rifles are all in a non-Soviet refurbished state, though none of the rifles feature a 100% confirming Spanish marking such as the "Made is USSR" mark. Several examples feature wire sling hangers, and one example features a Spanish style flat head cleaning rod. All of the rifle's serial numbers fall close to other reported and confirmed Spanish Civil War Mosin Nagants. So what is the meaning of this cartouche? Unfortunately, research into this mark has not yielded a 100% verifiable history. However, 7.62x54r.net forum member 'mstrbtg' has done a bit of research into the mark and discovered one possibility. As is fairly well known, many organizations in the international community played a role in the Spanish Civil War, both directly and indirectly. One such group, located in Britain, was the National Council of Labor. This group represented several British labor groups, including the Labor Party. Their ultimate goal in the conflict was to provide relief to the Spanish people, and such aid was "usually restricted to food, tobacco, medicine and lorries to distribute the goods". The organizations involved with this group did not advocate the use of force or violent interventionist activities of other international brigades. Therefore it would seem unlikely that the group would have been given weapons. However, there is always the possibility that individuals involved with the effort to assist the Spanish may have been issued a personal defense weapon, as there was always a certain possibility of being involved in combat while in Spain during the civil war. These rifles may have been marked with this cartouche to show that they were in use by the organization. Of course, this is all speculation based on research into the topic. At this time the true meaning of the "NCL" cartouche is unknown. It seems likely that the mark is indeed of Spanish origin, as all reported rifles feature several Spanish Civil War rifle traits. However until more research can be done into the cartouche, it will have to remain in the unknown category. Another example of an NCL marked rifle has appeared. The rifle itself is a 1936 dated Izhevsk M91/30. While it lacks any specific Spanish markings it does have wire sling swivels and has a serial number in range of known SCW rifles. 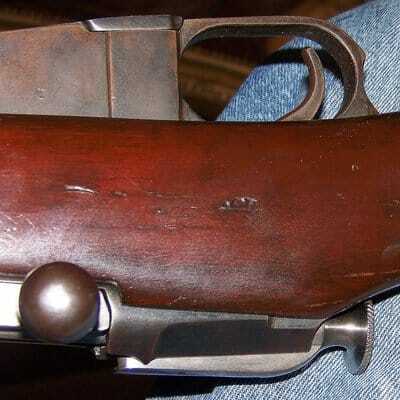 It also features early button style barrel bands found on transitional M91/30's. The NCL mark is found on the right hand side, canted slightly to the right side. Thank you to 'Alsky' for providing this interesting rifle! A member of the Gunboards forums has come across another example of an NCL marked M91/30. The rifle itself is a 1936 dated Izhevsk M91/30 and falls within range of known SCW rifles of that year and manufacturer. While there are no Spanish specific markings, the rifle does have wire sling sviwels of a Spanish style. 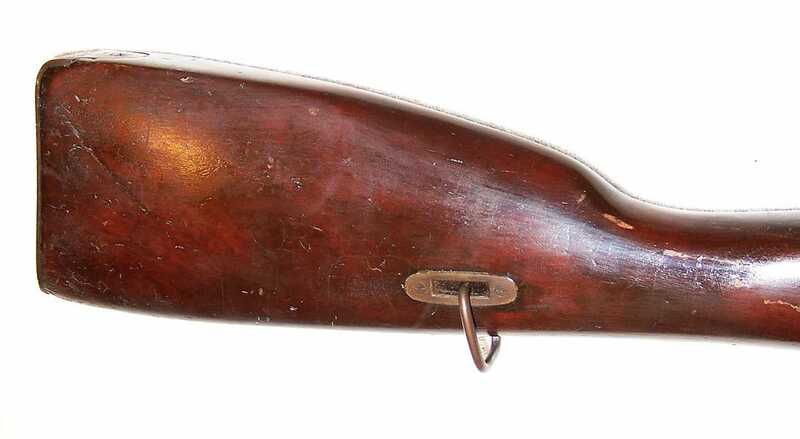 This rifle is the second example to feature the NCL mark on the right hand side and upside down. 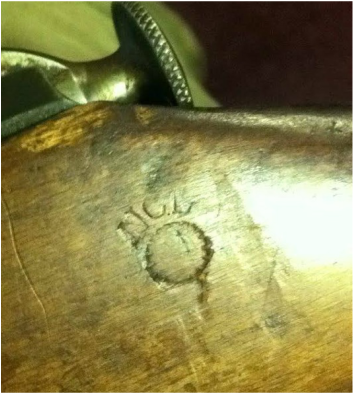 The cog wheel of the marking seems to have either been poorly struck or sanded off slightly at some point in the rifle's history, but the NCL letters still remain. Minus the mismatched status of the rifle, it appears to be in excellent condition relative to other examples of SCW rifles. Thank you to "Sgt Frank Rock" of the Gunboards.com forum for providing the photos of this interesting rifle! 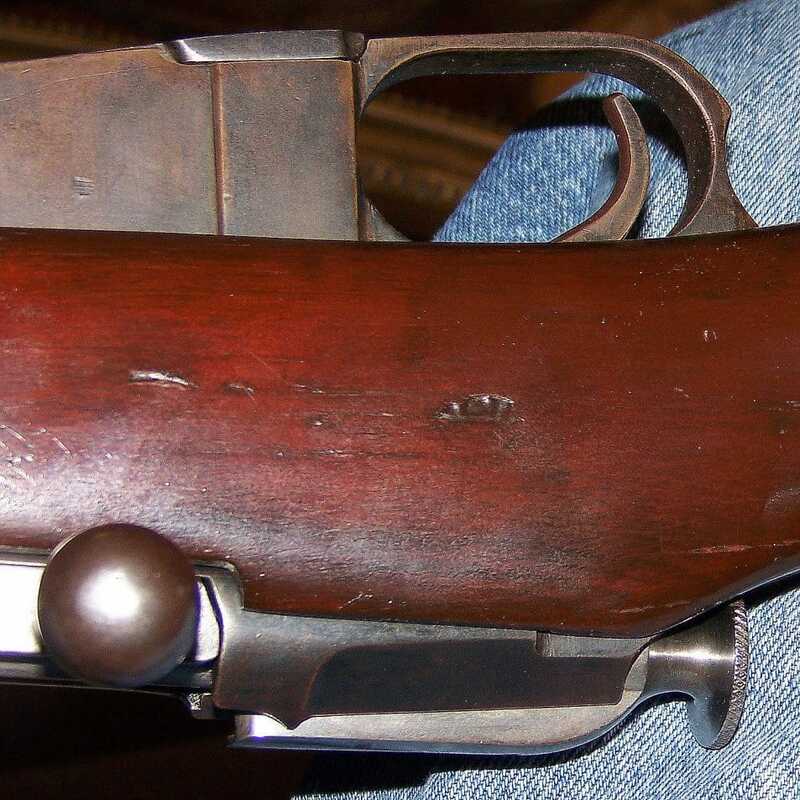 A reader of this site has submitted another example of an NCL marked rifle. This example is a 1936 Tula M91/30 that has had it's stock cut and receiver drilled and tapped for a scope mount. The NCL cartouche is in the same typical spot on the left hand side of the stock. There are no specifc Spanish markings on the rifle unfortunately. Another example of an "NCL" marked rifle has been provided. This rifle was a 1937 dated Izhevsk M91/30. It's only Spanish feature are the wire hangers. While it came out of a Vietnam vet's estate, it would seem to more likely have a Spanish origin, though only an in person analysis would confirm this. As with all other "NCL" marked rifles, the cartouche is found on the left hand side between the trigger guard and receiver. Hopefully more examples will come forth as word of this fairly unknown cartouche spreads.